I hadn't realised until this morning that my post on the Kingdom of Sand had drawn a comment from Kora, the owner there, pointing me in the direction of the other builds by Baal Zobel. I am outrageously busy at the moment, but I see exploring in SL as part of that work, as I so often get ideas or learn things from the way that other people do things. So I went this morning to explore Golgothica. 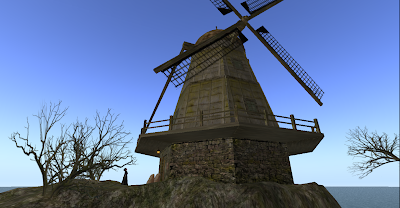 You can fnd an SLURL to it here. The conventions for getting to the build seem roughly the same as for the Kingdom of Sand: you are teleported to an area where you can buy into the role paying game and get clothing that is appropriate, or you can get a guest tag to wear, which will make the teleports work for you. I bought a weapon, which incuded a game controller etc because I was misled into thinking it was essential, and then found I could have worn the guest tag instead... something which contradicts the notecards which are thrown at you when you arrive. Never mind, the income from the weapons helps to keep the sim going, and having seen it, I am glad to support the effort. Once you are fit to go to the sim, clicking on the crystal ball transports you to the village. It's a no-fly zone, so you have to explore in order to get around. 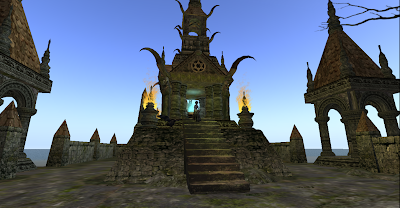 Golgothica is a role playing game with different roles and groups to join. I set my group as traveller and went off to explore. The building, texturing, design is wonderful, and I am sure I simply scratched the surface of what is available there. I would so love to build something like this with an educational purpose... a sim from the 17th century maybe. Once upon a time I was dismissive of the benefits of role playing and trying ancient crafts for example for oneself, but I have seen enough episodes of Time Team to know that you can learn things by trying out ancient crafts oneself, that it is impossible to learn from any book. It seems to me that there might be things to learn from a role paying historical sim... and things to teach. My ideal would be a game that is fun and interesting to play, but which provides ones with real information. However, just providing the role playing for fun is good too, especially when the construction is of the high level found here.